As seen on TV, make a home the Monty way. The inside story, every step from dream to reality. "...It's full of, it's built of, exciting original ideas. This could have been, you know, one big failed experiment but thanks to the genius of Dr Monty it's not only an engineering success, it's a beautiful house..."
Breaking news in retractable bathrooms. 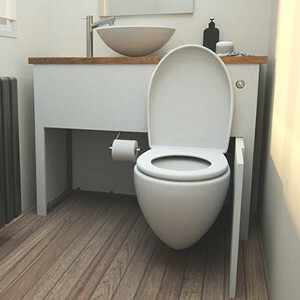 "Mad" Monty has come up with a cunning way to hide the whole bathroom - even in plain sight and talk about a space saving bathroom. See how he's folding all that 'washing-pooing' thing into the wall of your bedroom. HIDEALOO, "Cunning Way to Hide the Whole Bathroom"
With more than 100 projects to choose from, Grand Design’s Kevin McCloud had a tough job to whittle the TV Houses down to the ones that have really stuck in his memory. There have been some real gems throughout the time that the show has been on air. Peckham House was chosen as Kevin McCloud’s Grand Designs fourth best house of the entire history of the series. View the Article "Grand Designs best houses"
See the transformation of this site from empty space to extraordinary experimental Grand Designs house in South London. "Sliding Glass Roof House" aka "Urban Space Pod"
As seen on Grand Designs, the opening roof and sliding bed bath typify this unique and extraordinary response to the constraints and opportunities of a tight budget on an 'unusable' brownfield site. This is the story of some urban wasteland rescued by innovation and will power. It wasn't easy and we proved them wrong. Don't be scared, do it too, but take the tips, save some pain and use us as an example.